- What does the eResearch team do? eResearch, which broadly speaking is the application of advanced IT and communications technology to the pursuit of research is vital to being competitive in research of all kinds, but particularly domains where working at internet-scale is key to research outcomes. This includes climate change research and a wide variety of other scientific endeavours as well as the Digital Humanities, where UWS is building capability. The eResearch portfolio also embraces basic essential infrastructure for data management and reporting, which is key to researchers' compliance with the Australian Code for the Responsible Conduct of research, and with predicted changes to funding-body policies. There is basic information on eResearch at UWS at the eResearch web site (opens in a new window). This roadmap also provides an indication of expected growth and uptake of the services described. This will be used as a benchmark to plot progress. Budget requests and expected needs are based on these growth estimates. The following diagram shows how ITS, eResearch and other stakeholders will support eResearch infrastructure for UWS, with shared generic infrastructure at the bottom, and discipline/project specific tools and services at the top. The eResearch unit at UWS is currently resourced as a small consultancy reporting to the Pro Vice Chancellor, Research. The team aims to catalyse developments in eResearch, and as such does not take an operational role in providing IT services, but liaises between the major support services for research; Information Technology Services (ITS), the Library, the Office of Research Services and the research community to drive the adoption of eResearch practices and build eResearch infrastructure. The eResearch team will continue to play a lead role in driving infrastructure projects, in the three major strands of eResearch, data management, computing, and collaboration services. 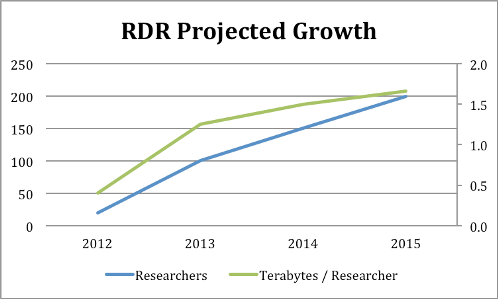 2013 will see the start of a change-management process to promote the use of eResearch tools and techniques to researchers, as the infrastructure projects come online. Note: the use of the word services throughout this document emphasises that we are talking about much more than computing infrastructure here. eResearch projects all include integration with institutional processes, service desk, service catalogue etc as appropriate to a core business system. The proposed eResearch Roadmap (eRR) supports and enables the four objectives of the UWS Research Plan 2012-14. Attracting research income requires reputation and track record that is visible; Pillar 1 provides access to and exposure of both publications and research data both in the UWS research publications repository1 and in the ANDS Research Data Australia (RDA)2. Automated feeding of data sets to RDA is being provided by the ANDS funded "Seeding the Commons" project3. Similarly, quality research requires exposure, as in Objective 1. In addition, researchers should be able to concentrate on their research rather than on the tools required to undertake the research, analysis and storage of data. Pillars 1 & 2 support researchers trough the application of automated tools (eg the ANDS funded "Data Capture" project4) and seamless access to high performance compute facilities with associated data storage access. Research partnerships are vital to extend the University's research penetration and impact. Pillar 3 provides the collaborative tool required to enable and support rapid and effective collaboration regardless of geographical and temporal separation. A fine example is the recently acquired NeCTAR grant ($1.3M) to set-up and implement a Virtual Laboratory for the multiple partners in the project: Above and Beyond Speech, Language and Music: A Virtual Lab for Human Communication Science (HSCvLAB)5. Objective 4 – Ensure UWS attracts and graduates high quality HDR students to its areas of research strength. HDR candidates now have a much higher level of expectation for modern collaborative tools as well as access to high speed and quality compute and analysis capabilities. Pillars 2 & 3 both provide these tools and services to ensure that UWS presents an attractive and technically advanced research environment for HDR candidates. The summary table below shows infrastructure projects to deliver eResearch services, starting in a staggered fashion, over the period from 2011 to 2015. Operational support for these developing services will largely rest with ITS, ORS and the Library. During this time, eResearch will expand into areas it is currently not able to address via a new institutional change-management project: promoting eResearch practice throughout the UWS research community, and providing a development service to help groups adopt eResearch tools. Lead infrastructure projects which will build capability in our stakeholders, resourced using UWS, and/or external funds, such as the Research Data Repository (ITS budget) and Australian National Data Service (ANDS) projects. A three-year plan for infrastructure projects is set out below. Assist in IT procurement and deployment for researchers, for example in sourcing research data storage and computing resources. Provide advisory services, for example assisting with grant writing, sitting on selection panels for technical staff to support researchers. Serve on project steering committees for eResearch projects (for example the MARCS Institute-led NeCTAR virtual laboratory). Assist in selecting and developing technology that has an impact on research, for example assisting with the current review of repository systems being conducted in the library. - Small projects conducted by Intersect as part of the eResearch Analyst service they provide. - Short training courses available to members on request. - Additional paid consulting. Examples include setting up a High Performance Computer for IIE, and writing a data management plan for HIE. Act as mentors on undergraduate Computer Science projects to encourage development of software. Of the above, the major focus is on (1) as solid IT and organisational infrastructure is the basis for good eResearch practice. A. Systematic development and deployment of professional development programs across the university, for example training in eResearch methods for Higher Degree by Research Students (HDRS) and their supervisors. i. Research computing user group. ii. Reproducible research practitioners network. iii. Digital humanities interest group. D. Evangelising eResearch, as services delivered by projects come on-line. Resourcing: The budget submitted for 2013-2015 for eResearch includes an eResearch outreach role. 2. Driving adoption of eResearch by rolling out high-impact eResearch tools to key research groups. Adapting eResearch tools (for data management, analysis, visualisation and modelling, as well as communications) for use at UWS. Deploying the growing array of tools that have been funded by the Australian National Data Service ANDS and now NeCTAR. Resourcing: There is very limited capacity to pursue this without additional technical staff, but as the basic data management, compute and collaboration tools are established that will free the two eResearch technical staff to work on this strand. B.Detailed collaboration with researchers on specific research projects. Resourcing: this class of activities is best done at the institute or research centre level; there is precedent for this in recent efforts in the Hawkesbury Institute for the Environment hiring a data manager and Short & McCarthy's proposed research centre in the Digital Humanities which includes two software developers with a dotted-line report to eResearch. Below we present matrices that show a coordinated approach to building eResearch capability across the major stakeholder groups. 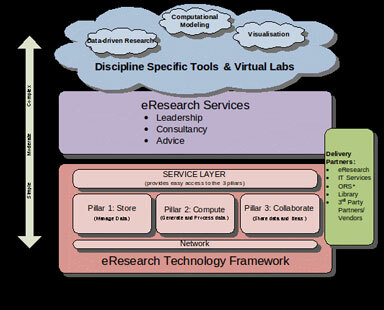 There are three eResearch infrastructure 'pillars'. Computing: high performance computing, cloud computing for analysis, modelling and visualisation. Collaboration tools: virtual labs, virtual research environments. In 2011 the eResearch team developed an Interim Strategy for a Research Data Repository, which is now established as a formal project, with a steering committee chaired by a representative of the PVCR. For each project there is a timeline showing a broad-brush picture of the developing service, as well as a table listing the impacts and budget implications on various stakeholder groups. These are all in draft and for discussion. Basic funding for storage and computing infrastructure growth which is essential maintenance of the services established by the RDR project. 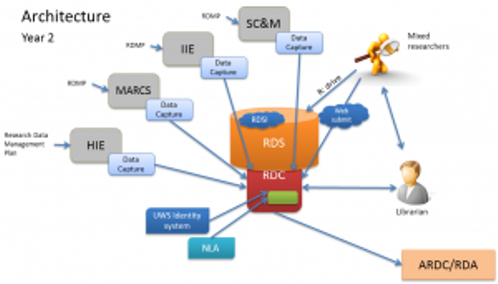 A continuation of the RDR project with a scope that will cover not only more services in Pillar 1, data management but integration with computing services (Pillar 2) and some basic collaboration services (Pillar 3). A project to scope the provision of one or more collaboration services (AKA VREs or Virtual Research Environments). This will produce best practice guidelines for collaborating using existing tools, and produce a more detailed roadmap for investment. A fourth strand will be undertaken using eResearch resources, to establish eResearch within the university. Short business cases are being produced for the first three projects above – once those bids are finalised the approved versions will be added to this document. Once the timelines for each project are established it will be possible to show an overall roadmap. 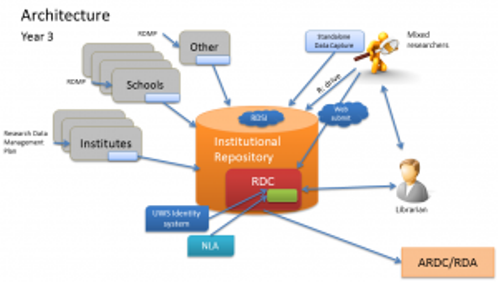 The Research Data Repository (RDR) (opens in a new window) provides the infrastructure and the catalogue function for researchers to be able to store, share, cite, and archive research data, in accordance with policies, requirements, and best data management practices. Included are the services and information required to define, promote, and provide the RDR to researchers. Build services and acquire software to identify, capture and manage key research data in institutes, research centres and schools from its time of creation to archiving, dissemination and citation, allowing world-class high profile research that is visible and will score highly in current and future research metrics as well as ensure compliance with relevant codes. Link managed research data storage to flexible on-demand computing services to enable research data processing, analysis, modelling and visualisation. Provide essential basic collaboration services at the data and computing level, allowing UWS researchers to establish partnerships within Australia and globally (OBJECTIVE 3, research plan). It will be rolled out over the next few years and firmly established by mid 2013. Full adoption for large numbers of users will take time, partly because of the length of the research lifecycle, such as the time between preparing grant applications and finalising projects or the timespan of a PhD over several years. The chart below displays the same information as the table above. These estimates assume that there are a number of latent potential users who have sufficient connections to eResearch by word of mouth, who will also immediately see the value of the service and begin using it. Following 2013, additional users will be brought in through concerted communications and further word of mouth, but the growth may be slower. It is also impossible to estimate the use in terms of storage size, as large teams may have small data storage needs (their data does not consume as much storage space), and small teams may have large data storage needs. Working Research Data Catalogue with data collections described and sent to Research Data Australia (per Australian National Data Service requirements). Data management plans for four (4) Institutes or Schools, such as HIE, MARCS, IIE, and SCEM. RDR is "Business as usual"
Integrated with computing and collaboration projects. ITS Service established to provide storage in simple and medium complexity scenarios. Peter Bugeia of Intersect is developing an interim UWS Research Computation strategy which will recommend changes to the way high performance computing service, servers, desktop and laptop computing, and software licenses are procured and provided to researchers. The computing strategy will also look at IT service integration with the research project lifecycle and existing ORS systems and processes. A key objective of the strategy and resultant project is to provide easy pathways for researchers to identify and obtain the computing environment, software and technical support they need to do their research. Researchers will be able to focus their efforts on their research rather than worrying about the infrastructure. Better infrastructure planning and budgeting made possible through early identification of research project computational requirements. Greater consolidation of computational infrastructure with economy of scale benefits. Co-ordinated access to external cloud and supercomputing computing facilities. 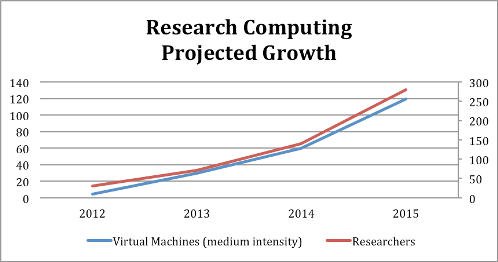 Virtual machines are considered the best measure for growth, as there may be small research teams using several virtual machines, or large research teams that only need one high intensity machine; however, the number of researchers is also estimated, to be able to plot user uptake. These estimates assume that there are a number of latent potential users who have sufficient connections to eResearch by word of mouth, who will also immediately see the value of the service and begin using it. Following 2013, additional users will be brought in through concerted communications and further word of mouth, but the uptake may be slower. Research Computing Strategy 3-year project budget approved in principle. Establishment of 1 to 3 researcher user groups around researcher software. An increase in the number of researchers using national supercomputing facilities to fulfil their computational needs. On line resources which researchers can access to inform and assist them with obtaining research computing. Research groups with special needs defined. Additional service calls from researchers. Service requests auto-triggered by ORS systems. Possible Introduction of a researcher self-service provisioning model using software such as open-stack. Additional research-related software licences, increased site licenses. Possible renegotiation of research-related software licence terms with vendors to allow operation in virtual environments. Every research project to have a "research project computing strategy". This implies some changes to RHESYS (data entry) plus operational changes. 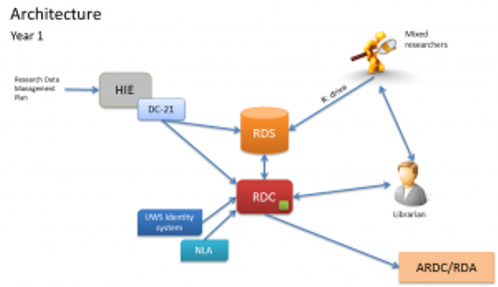 Linkage of RHESYS to IT service system. The third major component of eResearch is collaboration, including project communications, dissemination of research, and collaborative work based on research data and computational processes. While many disciplines and projects need very specific software, there are some common services that will be useful across many, if not all research projects and groups. Virtual Research Environments (VREs) fill this gap providing a web presence for a group, repository services for data, ways to share and discuss research, with links to the RDR and compute facilities. Participate in project to choose and deploy 1 or more VREs. Library Repository and catalogue systems will need to provide feeds to VREs. ORS Research systems will need to provide feeds on projects/grants etc for use in the VRE for authorisation and for information. Intersect may offer support/hosting for eResearch applications on top of RDSI storage and NeCTAR cloud services.